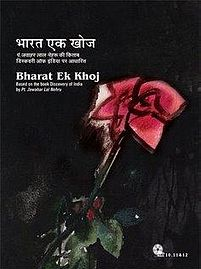 Episode two of Bharat Ek Khoj – Hindi TV serial – which is based on Jawaharlal Nehru’s book – Discovery of India – is titled as : The Beginnings. As the name suggests, it tries to explore the time when the civilization was just starting to form. When Pt. Nehru was in prison during his freedom fighting days, he felt the mental vacuum based on the environment of the place. This vacuum gave him the opportunity to connecting the dots by making his thoughts and ideas from the beginning of the time to the current (time when he wrote the stuff) situation of Bharat (aka India) and its culture. The quest not only provided him a creative stuff to fill up the vacuum but also lead him to a voyage of finding the roots of the civilization. It moves ahead with narration (by Om Puri) where he explores the fact that the Indian scholars were always keen to find the truth about the beginnings of the universe, which ultimately lead us to the current time. The history is a flow of various events reflecting the time, surroundings and the way of living and thinking of the people belong to the specific time span. The ancient Indian literature (the Vedas, the Puranas, the Poetry, the stories and tales, and many other form of literature) proves the hunger to find the roots was so keen in Hindustani scholars. Water is considered as the basic most necessity for humans (and any other species for the matter of fact). Actually if you look from a scholar’s point of view, the famous legend of the Dashavatar (the Ten Avatars of Lord Vishnu – who is considered as the administrator of the society) reflects the biological advancements of species pretty well. Maysya – means fish – it lives in the water, and the first full-fledged life was started there. Water is, of course, the driving force for all the species since then. Kurma – means tortoise – which lives in and out of water. Water remains the driving force, but the species made advancement in biological structure and became capable to live on land as well. Though, dependency was huge on water resources. Varaha – means boar – lives in and out of water, can spend comparatively more time on the land. It has the organs transformed in different way as the legs are grown, face was changed, and it can rely on the food and other stuff grown on the land. Narsimha – means half man and half Lion – now the biological transformations are even more advanced. Various species came to existence which lead us ultimately to the homo sapience sapience. Vaman – means the dwarf – the human structure was almost formed and the life moves on in the direction which leads to the current times. The rest of the Avatars Parashuram (aka Parashurama) – mainly belongs to the Vedic Civilization, Ram (aka Ram) – belongs to the time of ideal formation of social segments and way of living in an ideal society, Krushn (aka Krishna) – belongs to the time of not-so-ideal society but very near to current time we live in, Budhdha (Gautam Buddha) – belongs to time when the man – fed of material happiness went on the quest to find the truth and root of real human qualities. And the last, Kalki avatar is yet to be happened. One other thing to notice is the civilizations are known with the names of various rivers. It is due to the fact, that the water is the main resource we do rely on (of course, light, air etc, are naturally available everywhere, but for water, you have to find the source). Be it Euphrates, Tigris, Ganges, Sidhu, Saraswati or any other major river. This episode very thoughtfully represents the ancient time and the beginnings of the civilization, in a way that, possibly this could have been happened. In addition to show some of the geological sites, it shows a dramatic representation of the society during old times. The metaphors here are not to miss. For example, you see a boy was stealing fruits and other stuff mischievously. The formation of various groups were already started. People started doing business and transportation. The use of stories and dramas was started not only for entertainment but for conveying the message also. Whatever attributes shown in this episode are still reflected in the society. Reference to the importance of animals and places like Meluha are also found in the episode. Though some places are referred with their modern name, which may not be used when the book was written. But it is nonetheless an informative journey to find the roots. Roshan Seth plays Pt. Nehru effectively. Narration of Om Puri is quite good. In the dramatic representation the seasoned actors worked and they all performed really well. The sets and background music is authentic. The aerial cinematography is fantastic, especially based on the resources available at the time of shooting and the budget of the TV serial. The screenplay and the execution make it even better. The TV serial proves that within the small budget, if one’s vision is clear, he/she can represent the authentic material in lovely manner. Especially the people who love to know the facts of history will like the TV serial episode.